Khaldiya, a 17-year-old Syrian girl housed in the Za’atari Refugee Camp in northern Jordan, pressed her hand against the window of her living quarters, her fingers silhouetted by the bright sun. “My head has too much going on in it,” she says in Arabic. She, her parents, and her six younger siblings, fled Syria three years earlier, and today she’s a different person, Khaldiya explains. When once she was lonely, now she has friends; once shy, now she’s courageous. But she’s also mad. That empowerment lies at the heart of documentary filmmaker Laura Doggett’s “Another Kind of Girl Collective,” founded in 2014 as a way to give refugee teenage girls the ability to creatively express their inner worlds. 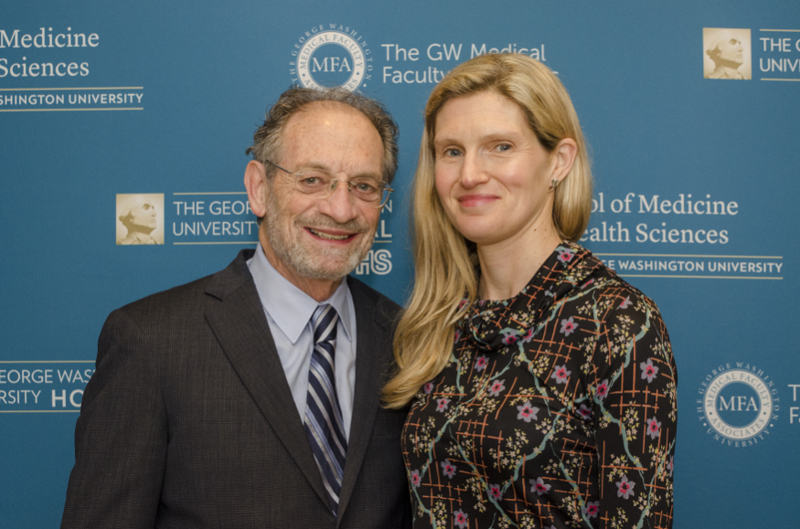 It’s also the focus of Doggett’s most recent recognition, the Daniel S. Prager Award for Opening the Human Spirit, presented by the George Washington University School of Medicine and Health Sciences (SMHS). What’s extraordinary about Doggett’s work, Griffith adds, is that Doggett herself is not filming; rather, she provides the girls with cameras, gently guides them on technique through workshops, and collaborates with them on editing. “The girls aren’t just simply recording, they’re creating art,” Griffith says. As works of art, each of the seven documentaries screened at SMHS as part of the Department of Psychiatry and Behavioral Sciences’ Grand Rounds is unique: Raghad finds her sorrow and frustration best expressed through physical movement; Walaa, who demands to be heard, is the sole survivor of a shooting that killed her two best friends; Rafif is focused on goals, on training at a salon and one day returning to Syria; Mona dreams of becoming a fashion designer and practices walking a red carpet in the fields surrounding the camp. “What the girls say again and again [is] ‘We just want people to know we’re like other teenage girls, and we have dreams, and we have visions, and we’re not these tragic stories,’ ” Doggett says. The filmmaking process has been transformative, she adds. “The [girls] start to see that their voices and their stories are valued,” she explains. The Another Kind of Girl Collective has proved so successful – the films have garnered awards and been screened at international festivals and conferences – that Doggett is extending the project to girls in Peru, Mexico, and the Bronx, New York. “[We] are really proud of this,” she says.